Yet again Felicity Heaton has pulled it out of the bag with this superb book. I am a great admirer of Ms Heaton’s writing and especially this amazing series. I have loved every single book and this book is no exception. Again, it has it all, with love scenes that make you tingle and also plenty of action. Evil has risen again which has brought previous characters to help our two new characters in the book. 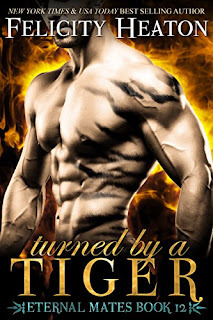 Talon is a tiger shifter and Sherry, a human who works behind the bar in Underworld, a club run by a jaguar shifter whose name is Kyter. The story starts with Talon, managing to escape his captors but having been badly injured, knows the only place he could go to get away would be the club, Underworld if only Kyter would allow him in. He makes his way there and falls through the door but not only does he come across the jaguar but also a human called Sherry who comes to his defence against Kyter. Looking at her, Talon knows he has found his fated mate. The story is a really great romance with sizzling love scenes but with everything going on in the story it makes this book a real page turner. I loved the book Ms Heaton and I am a number one fan of this series. Brilliant.